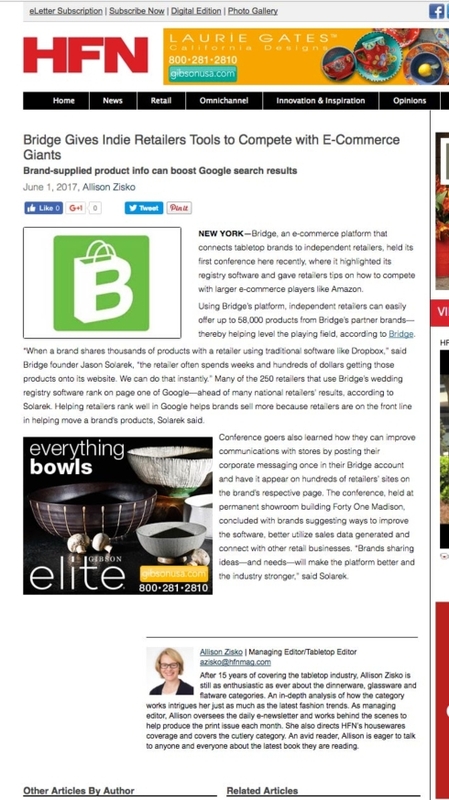 NEW YORK—Bridge, an e-commerce platform that connects tabletop brands to independent retailers, held its first conference here recently, where it highlighted its registry software and gave retailers tips on how to compete with larger e-commerce players like Amazon. Using Bridge's platform, independent retailers can easily offer up to 58,000 products from Bridge's partner brands—thereby helping level the playing field, according to Bridge. "When a brand shares thousands of products with a retailer using traditional software like Dropbox," said Bridge founder Jason Solarek, "the retailer often spends weeks and hundreds of dollars getting those products onto its website. We can do that instantly." Many of the 250 retailers that use Bridge's wedding registry software rank on page one of Google—ahead of many national retailers' results, according to Solarek. Helping retailers rank well in Google helps brands sell more because retailers are on the front line in helping move a brand's products, Solarek said. Conference goers also learned how they can improve communications with stores by posting their corporate messaging once in their Bridge account and have it appear on hundreds of retailers' sites on the brand's respective page. The conference, held at permanent showroom building Forty One Madison, concluded with brands suggesting ways to improve the software, better utilize sales data generated and connect with other retail businesses. "Brands sharing ideas—and needs—will make the platform better and the industry stronger," said Solarek.